Würth’s A/B clip and fastener assortments come with 185 types of the most commonly used body shop clips and fasteners including bumper clips, fender clips, grill clips, trim panel clips, splash shield clips, plastic anchors, plastic and metal rivets, push nuts, U-nuts, and more. Our clip and fastener assortments come in ten storage boxes complete with barcode labels and pictures that integrate into the Würth SIS™ inventory and invoicing system. 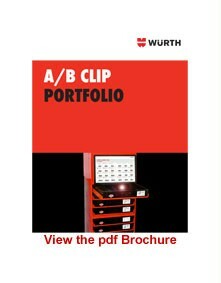 The Würth clip and fastener assortment makes it easy for our customers to keep their most used body shop products organized and easily accessible.